At Patio Place, we sell and deliver a wide selection of discounted, brand name patio furniture, which will complement any Dana Point apartment, condominium, home, hotel, restaurant, cafe, spa, golf course, or other property. Our showroom in Costa Mesa displays our many stylish extruded aluminum, cast aluminum, and wicker patio furniture sets and individual pieces, as well as our collection of significantly discounted, brand name fire pits, fire tables, barbecues, grills, umbrellas, gas logs, fire glass, bar stools, and more. 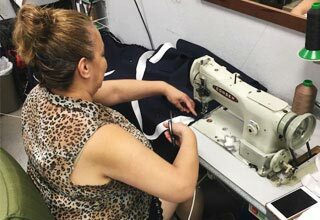 We also carry a selection of over 600 fabrics so you can completely customize or revitalize your patio furniture with custom-made replacement pillows, cushions, and slings. Additionally, we offer Dana Point customers skilled patio furniture repair and cleaning services. As a family-owned business, we pride ourselves on delivering superior customer service. Throughout the years, we've helped thousands of residential and commercial customers in Dana Point and the larger Orange County area. With our experience and expertise, we can help you furnish and decorate any outdoor space, no matter its size, layout, or style. We'll assist you in finding patio furniture to accommodate your needs and preferences, and special order merchandise if we don't have it in stock. We'll even go the extra mile when delivering your purchases as we will remove your old outdoor furniture, clean your outdoor space, and then assemble and set up your patio furniture, umbrellas, bbq, or other outdoor patio accessories for you. With honest, expert recommendations, value pricing, and a huge inventory, Patio Place is Dana Point's best choice for patio furniture, BBQs, grills, fire pits, fire tables, gas logs, bar stools, and much more. Call or visit us today. Whatever your outdoor living needs in Dana Point, Patio Place carries the names you trust for the lowest prices in and beyond Dana Point. In business for over 25 years, we have long-standing relationships with leading manufacturers and negotiate the best deals on the previous year's selection of patio furniture, fire pits, umbrellas, barbecues, grills, gas logs, and other outdoor accessories. With so many options to choose from, our friendly and knowledgeable staff will help you find exactly what you're looking for, and in a price to fit your budget. 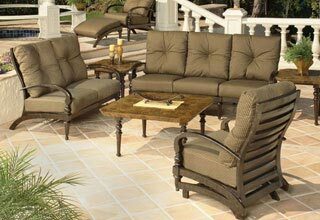 Dana Point customers can choose from our incredible inventory of attractive patio furniture in extruded aluminum, cast aluminum, and wicker styles. We sell beautiful patio furniture sets, as well as individual patio chairs, patio tables, loveseats, outdoor sofas, sectionals, swings, garden tables, end tables, outdoor sofas, swings, bar stools, bistro tables, and more. From contemporary to Mediterranean looks, we have outdoor furniture to suit every type of home or business in Dana Point. We can also give your Dana Point outdoor space a distinctive look as we offer a wide selection of attractive fire pits and fire tables in slate, cast aluminum, marble, granite, and other designs. 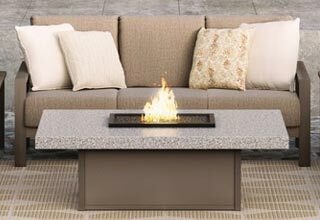 Enhance your outdoor area further with ceramic gas logs, river rocks, reflective fire glass, and other fire pit accessories. 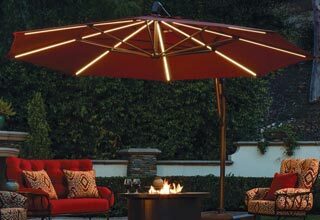 Or, add a splash of color with patio umbrellas in varying sizes and designs, including cantilever umbrellas, auto-tilt umbrellas, push-to-tile umbrellas, and custom-made umbrellas. Our inventory also includes Fire Magic barbecues, grills, fridges, kegerators, and other accessories, which are perfect for any outdoor cooking enthusiast in Dana Point. BBQ gas-to-propane/propane-to-gas conversions and repair services area also provided by our experienced staff. And, we sell and install common replacement BBQ parts, such as hoods, lights, access doors, warmers, and range hoods. Call us today to learn more. For all of the above, we'll assess your damaged patio furniture and other items and provide you with honest recommendations, whether it means we fix it in-house, refer you to another specialist, or sell you a newer model for less than the cost of repairing it. If we repair it in-house, then you can be sure that we will use only the finest parts and components, such as Sunbrella or Phifer outdoor fabrics, which come with excellent manufacturer warranties. Call today to learn more.